cardigans and kids: what to do with all the tomatoes? what to do with all the tomatoes? Fresh tomatoes are best if there is no need to refrigerate them. However, if you countertop becomes covered with bowl of tomatoes and they are at the verge of needing the refrigerator - I recommend some tomato soup! This recipe calls for 4 pounds - so it really does help clear some space. 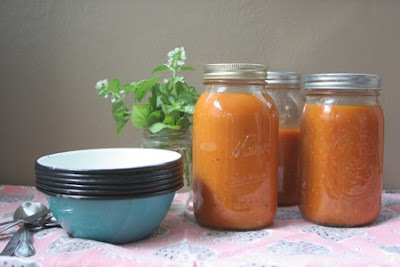 I have been sharing lots of tomatoes, but I also have had making some tomato soup in mind for freezing to have for when the temps drop and I begin making bread again. This recipe is a mix of two that I liked - one from Jamie Oliver and one from Soulemama. If you don't have tomatoes in your own garden, you should be able to find an abundance at a Farmer's Market nearby. 1. Roast the tomatoes. To peel them easily, bring a heavy bottomed saucepan to boiling, add tomatoes, boil for 1 - 2 minutes. Remove from heat, drain the water. I pour mine into a colander, and run cold water over, then let cool for a bit. Remove skins and slice in half. Remove the top of the core if you feel like there is too much core. Preheat oven to 400 F. Put tomatoes on pan, and add some olive oil, salt and pepper. Roast for 30 minutes. Be careful when removing from oven - there is a lot of juice! 2. While the tomatoes are roasting. Peel and chop carrots, slice the celery, and roughly chop the onion. Peel and mince garlic. 3. In a heavy bottomed saucepan, heat the butter and 2 tablespoons olive oil. Add the garlic, heat for 30 seconds. Add the remaining veg and cook for 15 minutes with lid on, stirring every so often. Until veg is tender. 4. Add the tomatoes and leftover tomato juices and vegetable broth. Add a couple dashes of sea salt and freshly ground black pepper. Bring to a boil, and then turn the heat to low and heat for 15 minutes. 5. Now to blend it up. If you have an immersion blender, use it ! Otherwise, carefully pour it in batches into a traditional blender until all of it has been blended. It is hot - sometimes I even give it a bit of time to cool off before starting the blending. (I do not have an immersion blender - someday.) As I am blending I am returning it back to the my pot on the stove. 6. Determine how much you want to eat now, and how much you want to freeze for later. What you are going to eat now, keep warm on the stove top, and the cream and basil. The rest pour into quart canning jars, tighten lids on them and I refrigerate until cool. Store in the freezer. Just like the batch you are eating the time of, thaw, heat the tomato soup and cream and basil, once heated through, serve. (Add more salt and pepper if necessary). Please make sure to leave at least an inch at the top of your jaw empty because the soup will expand as it freezes. For our family, we will eat it as a side to go along with mac and cheese or grilled cheese, so it will feed us 2 for 2 meals. So I will split the cream and basil amounts needed per amount of "meals" I'm making out of the tomato soup. Also, if tomato soup isn't your husbands favorite - over even close to it, as in our home - make sure to add some hot sauce his bowl and have it on the table at meal time.